Aurora, CO, August 08, 2017 –(PR.com)– HCA/HealthONE’s The Medical Center of Aurora has been recognized as a Best Hospital for 2017-18 in the Denver metro and Colorado by U.S. News & World Report. 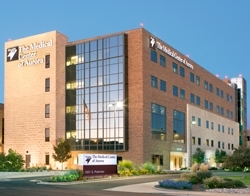 The Medical Center of Aurora was also recognized as high performing in five adult specialties which includes Diabetes and Endocrinology, Gastroenterology and GI Surgery, Geriatrics, Nephrology, and Pulmonology. TMCA also rated as high performing in four common adult procedures and conditions for the treatment of patients who are 65 and older, which included Heart Bypass Surgery, Heart Failure, Colon Cancer Surgery, and COPD. For the 2017-18 rankings, U.S. News evaluated more than 4,500 medical centers nationwide in 25 specialties, procedures and conditions. In the 16 specialty areas, 152 hospitals were ranked in at least one specialty. In rankings by state and metro area, U.S. News recognized hospitals as high performing across multiple areas of care. For more information on the 2017-18 rankings, please visit the U.S. News Best Hospitals page and use #BestHospitals on Facebook and Twitter.